For over 15 years, Bharti has helped over 50 thousand people in their personal and professional transformation. She believes in inspiring people to learn at every walk of life. She brings new innovative ideas, different methodologies, to relate and connect with today’s generation employees. 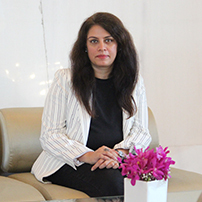 She is a Director at Inspire Human Potential Pvt Ltd and an Independent Director of Manpasand Beverages Ltd with the brand name ‘Mango Sip’ and ‘Fruits Up. of Neuro Linguistic Programming (ANLP) Her meeting with NLP was like ‘Love at first sight’. Since, then she has been exploring and practicing this vast, insightful art and science of excellence. Her passion for NLP took her to The International NLP Conference organized by ANLP, CIC at Heathrow, London, 2017. She has learnt from many stalwarts of NLP like Frank Pucelik, Michael Hall, David Shepherd, Terry Elston, Lynne Cooper, Wendy Sullivan, Peter Freeth. She has certified many people as Practitioners and Master Practitioners of NLP. She has conducted many workshops, sessions, talks on NLP at various different platforms. With her deeper understanding and practical approach towards NLP, she wants to revolutionize the way NLP is taught in India. Her mission is to apply NLP in the area of education, health & wellness and bring meaningful change in the society at large. Bharti has worked with an extensive range of people including Managing Directors, Vice Presidents, General Managers of the companies, TV stars, IT Professionals, Entrepreneurs, Clinical Psychologists, Counselors, Teachers and Students. Her approach towards each person is different. Her observations and probing skills makes her class apart. Her mission is to transform the lives of 5,00,000 people over 5 years. Bharti unleashes the unlimited potential within you. Her sessions have impacted thousands of people helping them to realise their true worth and take actions in right direction.